Recently I was writing about crafting ascended weapons without spending too much actual money on it. The biggest thing that makes this possible is gathering all of the components yourself. 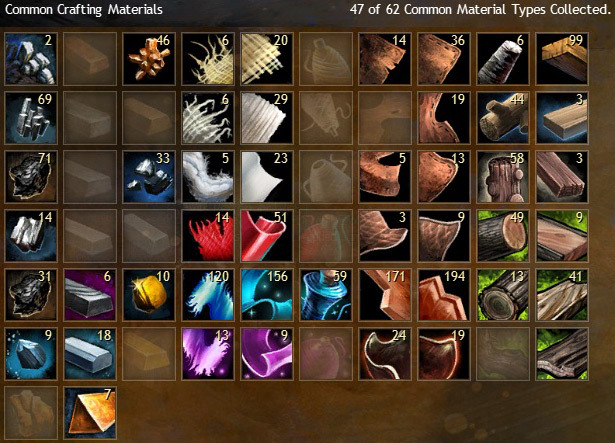 There are many websites out there already that cover the high end gathering nodes, but when you’re crafting ascended items, you’re going to find that you need mid-tier materials in large amounts. These, previously very cheap on the trading post, are now in high demand and can add up in value quickly. After a recent (quick) gathering run, going primarily for wood. You’ll also find that frequently, it’s wood you need more than metal. Wood requires more to refine, and weapons generally require more wood components than metal. The one exception to this is iron ore, which is used for both iron and steel ingots, but it’s so plentiful that it’s rarely something to worry about. So, pretty much what I am saying here is – go out and gather! Mid-tier mats are both plentiful and easy to gather; there are many more nodes of each type per map than of the high-level stuff, and unlike ancient wood or orichalcum, they respawn after one hour, as opposed to 24 hours. This makes it easy to build up a large stockpile of t2-t5 woods and metals, whether for your use or simply to make some money. This is not a detailed guide saying “if you go to this area in this zone you will fix X of this type of tree”, but rather a general idea of where to go for specific types of wood and metal, based on the experiences of myself and others in my guild. 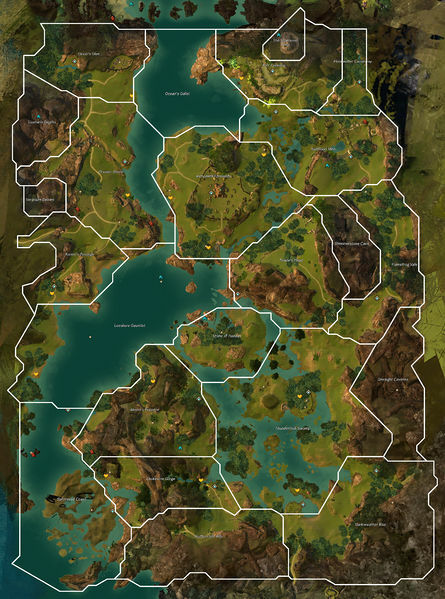 One of my guild members is in particular very talented at finding great patches for farming mats (and said she’s considering writing her own guide based on that); this is just a basic guide pointing out good places to try. 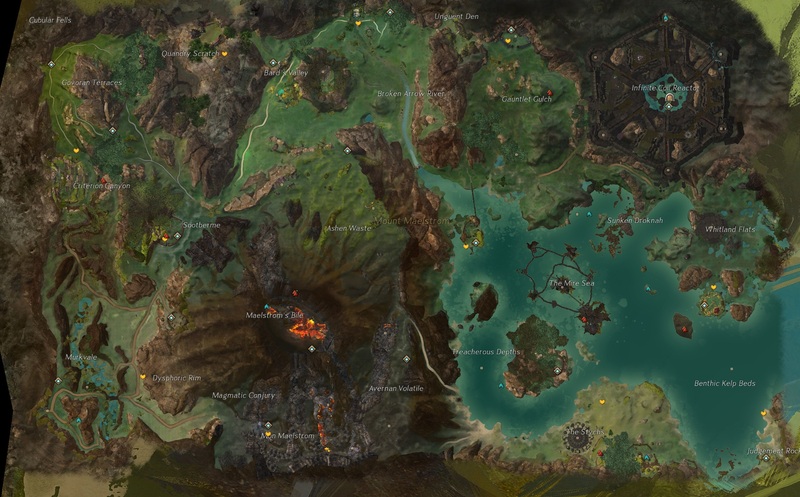 In particular, the eastern half of the map, as well as curving through the southwest portion, starting from Lion’s Arch up towards the portal to Queensdale. You also can collect large amounts of iron ore here. It’s a large zone, but patches of trees tend to be clustered fairly close together. Enemy density is also low everywhere but the very southern areas, which makes it easy to run from node to node. This is another zone where iron ore is also plentiful. 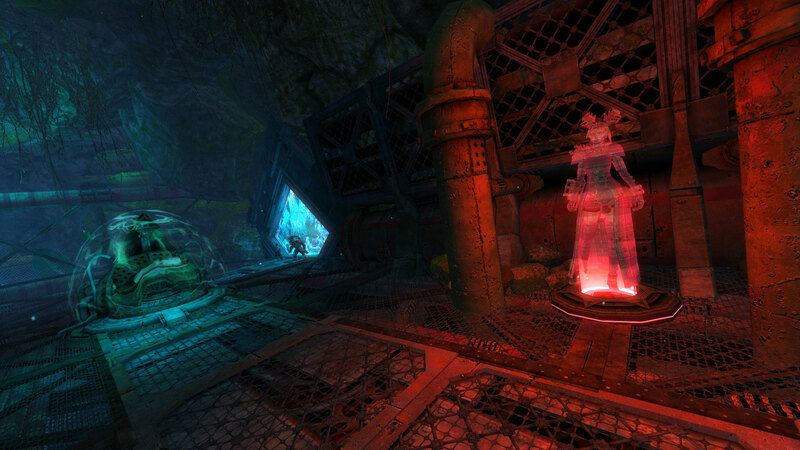 Sparkfly is a zone that has a significant amount of water, and right now it is generally highly populated because of Tequatl. 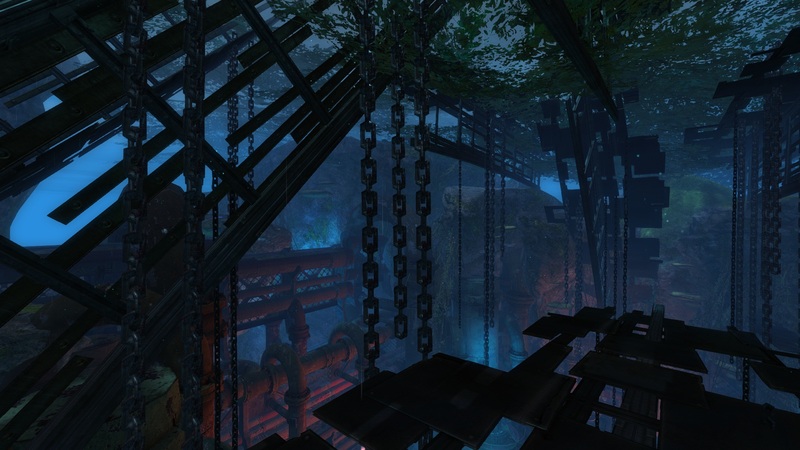 I love this zone for gathering, though; there are several places where I’ve found clusters of trees, and Sparkfly is a great place for also gathering platinum ore. 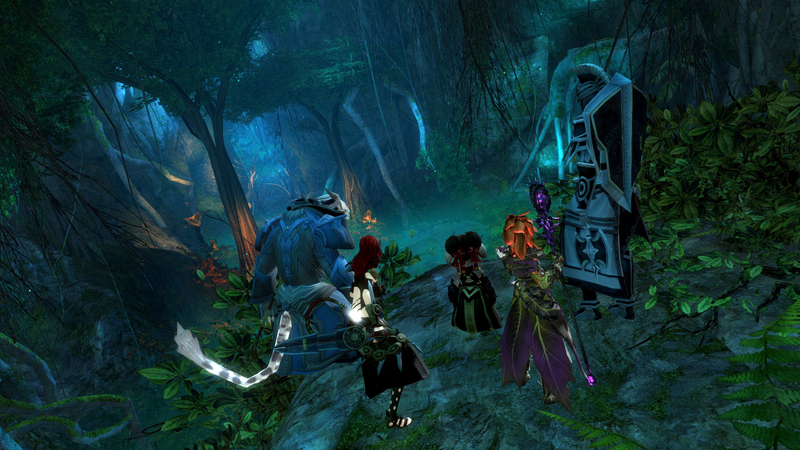 Gathering is a great way to kill time while waiting for Tequatl! Malchor’s has one spot in particular where there tends to be a cluster of trees around a statue. 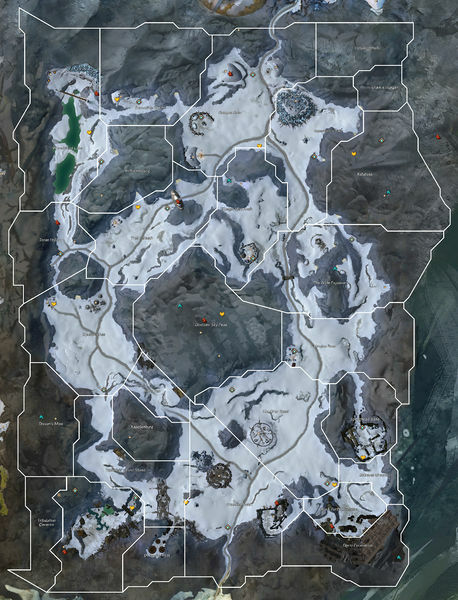 All of these zones are a good source of mithril ore; Straits and Fireheart will also contain hard wood and platinum, while Malchor’s, Cursed Shore, and Frostgorge are where you’ll find ancient wood and orichalcum ore. I love Mount Maelstrom. It’s a large zone with a high density of events, and I’ve also found it to be an amazing place, if not the best, for gathering. Now, you won’t find everything you need here, but what you can find here is in large supply. Hard wood, elder wood, platinum ore, mithril ore…there are multiple areas in the north-eastern part of the map where you will find many trees and ore nodes clustered close together. This zone also contains what we like to call the vanilla patch; four herb nodes just south of Crucible of Eternity that give vanilla beans at a high rate; the herb patches in general in this zone tend to be heavy on the vanilla. We’ve also found at least two rich platinum veins here. Mount Maelstrom is, hands down, my favorite place for gathering. If you haven’t been gathering the lower-end mats, or haven’t been too sure where the best places to look are, give these locations a try. Or if you do gather runs of your own and know of other good places to look. share those as well! But thanks to ascended crafting, these items are well worth taking the time to collect.